The latest issue of WTW is bound with Otabind process. Works That Work is about exploring the creativity that makes our lives better, so naturally we are constantly exploring creative ways to make the magazine better as well. Those of you who have already received print editions of Issue 3 (or seen the photographs) know that we are trying out a new binding. 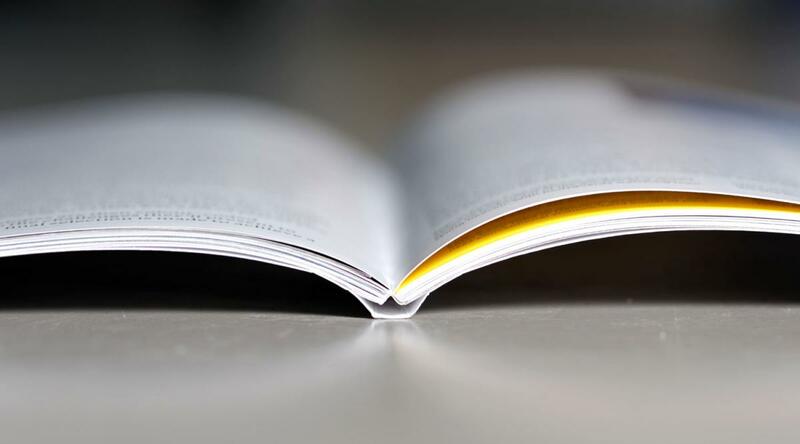 And since our previous choice of saddle stitch binding generated so much reader feedback, we thought it would be worthwhile to continue the discussion here. Our primary requirements for the binding have always been durability (so the pages don’t fall out even after years of enthusiastic reading) and flexibility (so that it stays open, leaving you one hand free for your coffee mug, teacup or family pet). The Otabind process, developed and patented in the 1980s by the Otava Bookbinding Company in Finland, fulfils both these requirements and also eliminates the staples which some readers found aesthetically displeasing. As you can see in the photo, the pages are sewn in signatures which are then adhered to a crepe or gauze liner (instead of directly to the cover) in a process called capping. The cover is glued to the first and last pages of the book block, which “floats”, taking stress off the spine, and lays flat when you open it. Additional flexibility is provided by using cold set glue instead of hot melt adhesives that stiffen and crack. Otabind is not without its challenges. It is costly. The cover has four creases instead of two. Extra care must be taken to insure that the paper grain lies parallel with the spine to maximise adhesion. Crossover images must be precisely aligned. There are not many binders who can do Otabind; in fact there are only a few countries where it is available, and we are fortunate that there are experienced companies offering this service here in the Netherlands, which not only facilitates our collaboration, but also helps reduce the carbon footprint of our operation. We worked with Binderij Hexspoor. We are look forward to hearing what you think about this, as well as any other aspect of your Works That Work experience.